Every six months we get a bit giddy, and everything in the shop is reduced by 25%. No exclusions, sub clauses, or fine print. Go straight to the head of the queue, mates rates, frequent flyer points, platinum card. All of that. Til the end of the month or until sold out. OK I’ll be honest option B has never happened. Who knows this time. 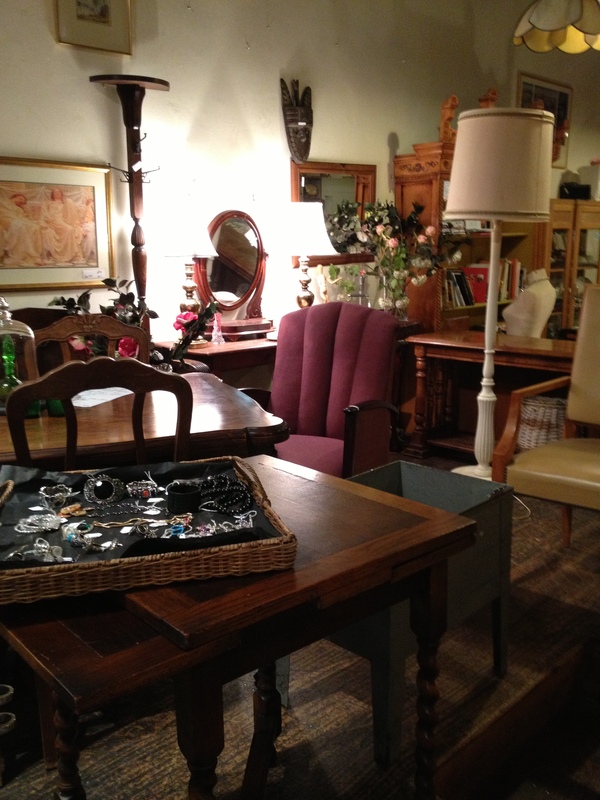 Our hours are 10 to 5 Monday to Saturday, and 1 to 5 Sunday. A Tasmanian oak hall seat with hat stand in the Jacobean Revival style. $399. A small oak draw leaf table from about 1930. $299. 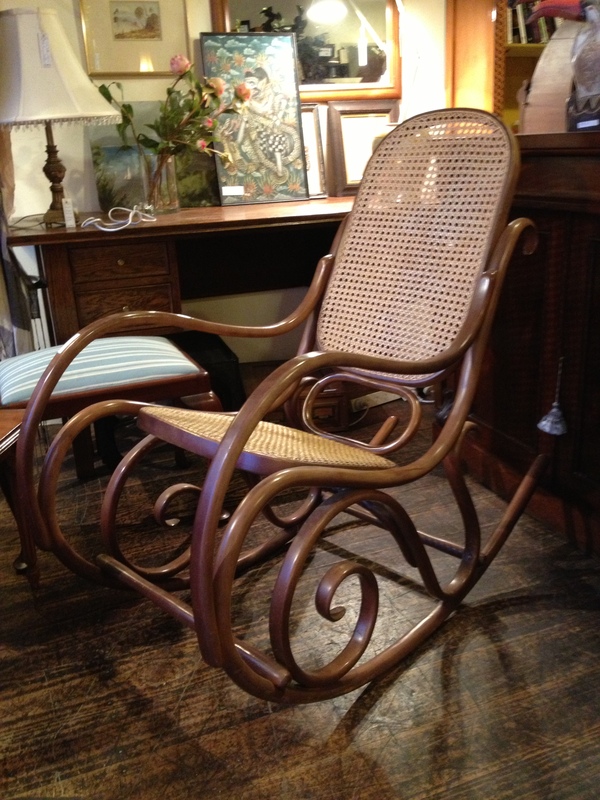 A reupholstered bright plum rocker with Deco sunburst style back, from the same decade as the previous item $139. In the front a further selection of modern costume jewellery. $5 – $19. Victorian cedar toilet mirror. $159. 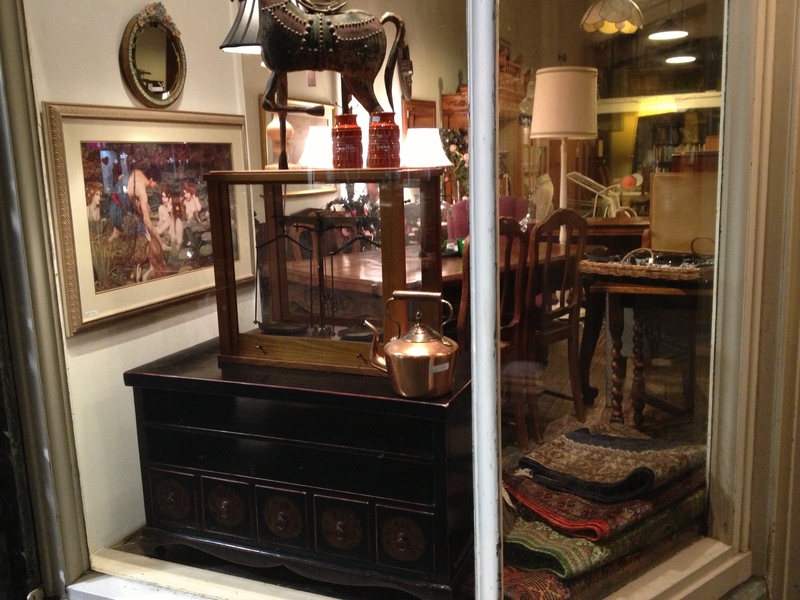 Displaying; Oriental side cabinet japanned with red highlights, ideal as TV stand with storage below. Sitting on top is a scientific scale in glass case with a full set of weights in separate fitted box. One glazed panel is damaged but repairable. $595. Above these, a metal horse from India. Now sold. Two vases from West Germany for $47. a Pre Raphaelite print by Waterhouse $49. On the floor to the right and assortment of Persian style rugs. $130 to $500. 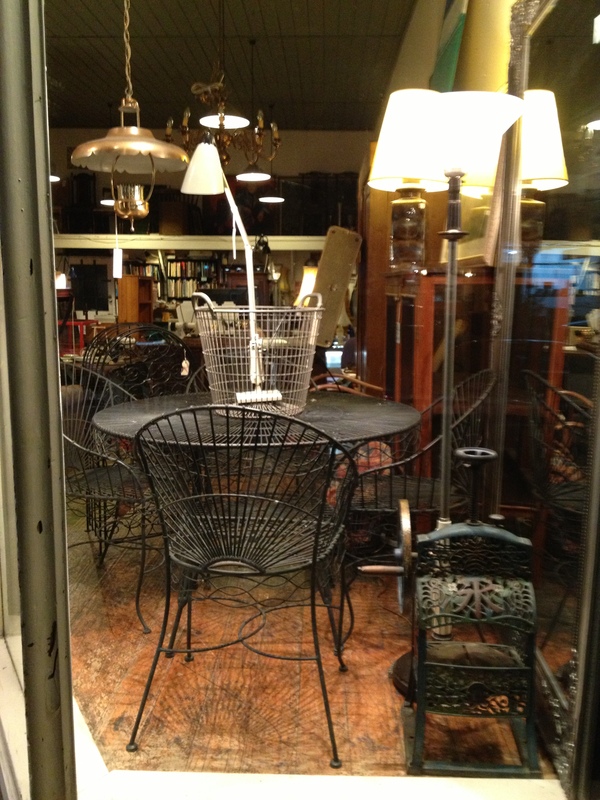 We are including a five piece Domo outdoor garden table and chairs that originally cost $2200. The table is 120 cms wide and the Grays price is $1150. 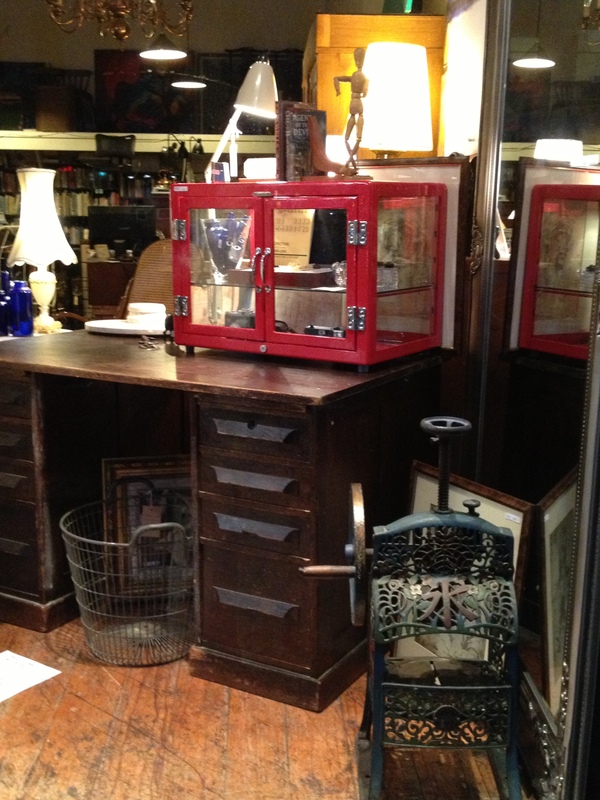 The red medical cabinet referred to in the previous post is now sold, however the ice shaver, Planet lamp and basket are still on display and available. 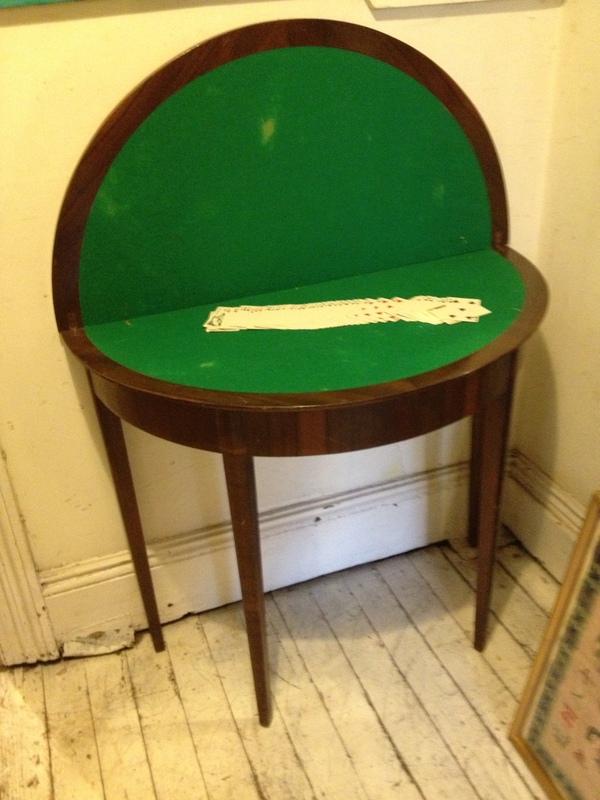 This semi circular card table folds open to reveal a round green baize playing surface. The rear legs move and angle out on two wooden hinges at 45 degrees. When set up all the four legs are equidistant ( hope all those angles add up to 360 degrees) and provide a stable games table. Of course it could also be used for Monopoly or dominoes.We believe the piece to have been made in the1950s and there is an elegant Sheraton look about those square tapered legs. $142 . There are a couple of small holes in the baize and a patch of white visible in this photograph.and this gives me the opportunity to mention Graeme Browne’s shop in Malvern Road, Toorak. 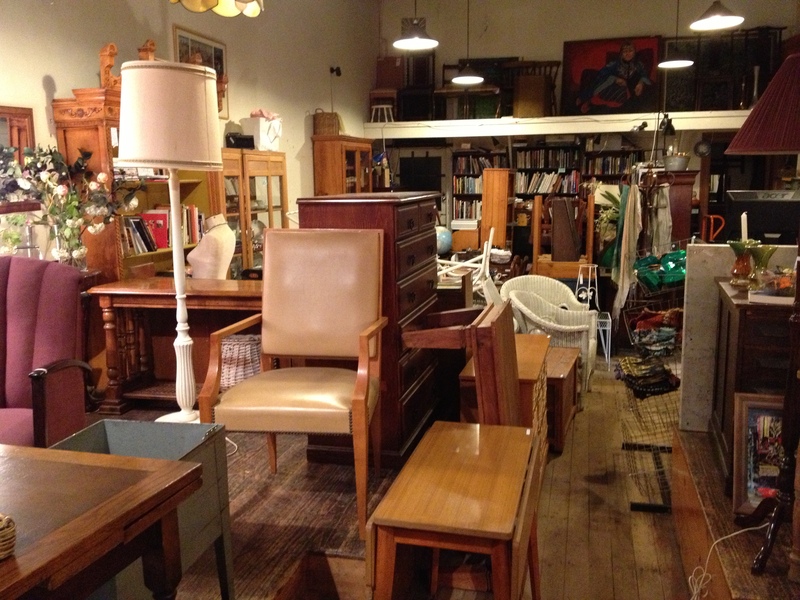 For many years this has been the “go to” place for restorers of furniture. They have a vast array of handles, wooden and brass, veneers, shellac flakes, key blanks, escutcheons (those little brass shapes around a keyhole) plus heaps more. It is just worth going to look around. Anyway we called just now, enquiring about green baize. Well they didn’t have it. But that’s ok, because they suggested we could check with Alcock’s the billiard people for the material. And then they recommended a Mr Steve Houghton of Hawthorn for the fitting.. That’s why they’ve been first stop for many of us hunting for a hard to get component or service. Browne’s have been going for over 30 years to our knowledge.